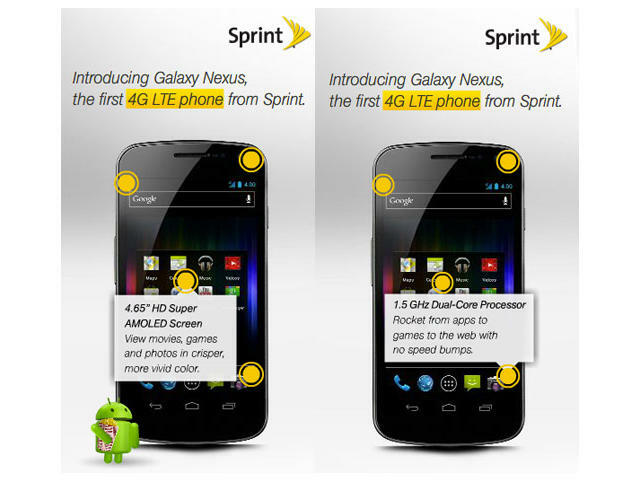 Galaxy Nexus Coming to Sprint with LTE? It Sure Looks Like It! It seems someone at an ad network may have gotten a little trigger happy today when an advertisement appeared on CNET outing the Galaxy Nexus as coming to Sprint with LTE support. Hot on the heels of Sprint CEO Dan Hesse announcing today the first cities to receive LTE service, a reader of CNET spotted an ad that talked about the first LTE phone from Sprint … and it's the Galaxy Nexus. Said reader took a screenshot and sent it over to Engadget, and now everyone and their brother knows that Verizon's exclusivity on this handset in the United States was obviously a time-based situation. The only difference between this version and the others out there around the world is it states it's sporting a 1.5 GHz dual-core processor as opposed to the 1.2 GHz the Verizon model. What is missing from this ad, however, is a release date. Sprint's LTE network isn't supposed to roll out until the middle of the year, and even then it'll only be in a few cities – primarily Texas – so will the phone release sooner than that, or was this ad way early? There's every chance Sprint will start selling it now and saying, "Won't it be great once our LTE launches?" but that seems like an odd tactic to us. Whatever the case may be, we're sure to learn more next week at CES 2012 and we'll keep you posted. Would you be interested in the Galaxy Nexus on Sprint?